I was watching PTI at the gym this afternoon and in the first four stories Wilbon and Kornheiser called something the greatest of all time. First up were the Patriots, who Tony said would go 19-0 and were the best football team of all time. Then came Devin Hester, the greatest kick returner of all time. Finally, after a brief respite during a college football discussion that flirted with calling South Florida the greatest something or other of all time, up came the Colorado Rockies who are on the greatest hot streak of all time. Cris Collinsworth did the same thing during halftime of last night's Sunday Night football game when he referred to New England as the best team he's ever seen. There's been scuttlebutt here and there that Tom Brady is having the greatest season of any quarterback ever, during last year's NCAA Tournament we heard that Greg Oden was the best Freshman to ever play college basketball. Unless it was Kevin Durant. Elsewhere there are articles proclaiming Brett Favre, Joe Torre, the USC football program, Roger Federer, San Diego State kicker Parker Douglass, Floyd Mayweather, motocross racer Ricky Carmichael , high school running back Jerandon Bussey and Roger Clemens the Greatest ______ of All Time. Appalachian State's win over Michigan was called the greatest upset of all time until that USC football program was defeated by a Stanford team that ASU would probably handle with ease. What's all the fuss about the greatest of all time? I think it has more to do with us than with anything these teams or players do in their chosen fields. We're obsessed with thinking that we are witnessing the absolute height of human achievement rather than just admitting that every era has its standouts, that its impossible to truly compare sports performances from one era against another except in the mind's eye. Sure, statisticians can create formulas that put things on an equal playing field but can anyone say with any degree of real certainty what would happen if Clemens took on Babe Ruth or if Tim Duncan's Spurs played the Knicks of Reed and Frazier? I'd love to see both matchups but until someone harnesses 1.21 gigawatts it's going to remain a fantasy. These mythical titles seem to exist just to start the next debate - If the Patriots are the greatest team of all time and the Colts beat them does that make the Colts the greatest team of all time? - and in that next debate no one is going to be more inclined to temper their remarks. I'm not saying any and all of these people are being mislabeled, except for the San Diego State kicker thing which is just hyperbole out of control. I'm just saying that our need to feel like we live in interesting and amazing times trumps any and all perspective about the length and variety of history. They called World War I the "war to end all wars" and as you'll note by the ongoing muck of Iraq that was more than a little premature. The generation that won World War II, the "greatest generation," went on to get us into Vietnam, presided over Jim Crow and helped create divides in this country that are still being fought over. And those are things that actually matter. Wouldn't it be both easier and more accurate to say that huge things and magnificent individuals exist in every era and just celebrate them that way instead of resorting to hyperbole that only serves to make us feel better about ourselves? Well said. I too am tired of every major achievement being hailed G.O.A.T. Sometimes members of media and casual fans as well need to calm down when they see greatness and recognize that there has always been greatness, yes even before they were around to witness it. Much credit to you for pointing this out. I couldn't agree more. 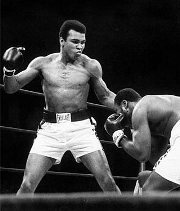 I think it is bascially a lack of skill or confidence that writers and/or commentators connot deliver a story with punch without declaring something the greatest of all time.